A prose poem is a poem written in prose rather than verse. But what does that really mean? Is it an indefinable hybrid? An anomaly in the history of poetry? Are the very words "prose poem" an oxymoron? 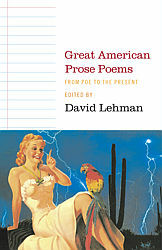 This groundbreaking anthology edited by celebrated poet David Lehman, editor of The Best American Poetry series, traces the form in all its dazzling variety from Poe and Emerson to Auden and Ashbery and on, right up to the present. In his brilliant and lucid introduction, Lehman defines the prose poem, summarizes its French heritage, and outlines its history in the United States. Included here are important works from masters of American literature, as well as poems by contemporary mainstays and emerging talents who demonstrate why the form has become an irresistible option for the practicing poet today.